← Montana Skies Rocks Setroma Amphitheater in Cary’s Bond Park! It’s October and it is time to find the perfect pumpkin! There are several different local farms where you can go right to the patch and pick your own. A few of the local favorites include Ganyard Hill Farm in Durham, Green Acres Farm in Cary, DJ’s Berry Patch in Apex, and Vollmer Farm in Franklin County. There are many other great farms in the area as well. Visit the Pumpkins & More website for a list of of pumpkin patches, hay rides, and corn mazes in NC organized by county. 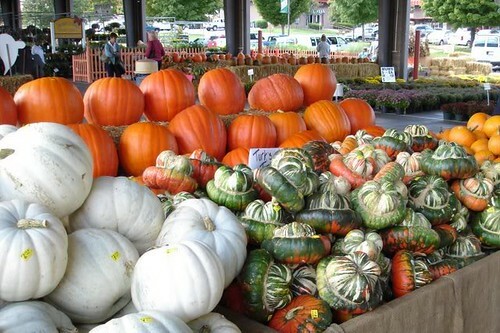 You can also pick up a great pumpkin at the Raleigh Farmer’s market (pictured above). 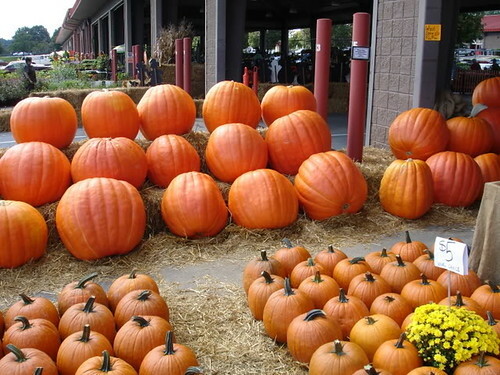 They have a wide variety of sizes and shapes and even sell white pumpkins! A pumkin decorating contest will be held at the market on Thursday October 2nd with cash prizes for the best decarated pumkin in each age group. Check out the Farmers’ Market website or download the contest announcement here for details on how to enter. It’s off Mt. Herman Road, behind Brier Creek in Durham, and it now offers pumpkin picking! We take our class there every year for strawberry AND now pumpkin picking, and they are AWESOME! Beautiful, down-home REAL working farm (unlike some local amusement-park like attractions where the big kids trample the little kids) where you can let your kids experience the farm just like you did way back when! I can’t say enough good things about this place- they’ve been so gracious to our class of preschoolers each time we’ve visited, and we’ve gotten to pick REAL, off-the-vine pumpkins (great for teaching pumpkin life cycle, teachers!) instead of the random grocery store pumpkin sitting in a random field a lot of nearby “pumpkin patches” do. Every time Mr. Page has shown us something cool- a baby strawberry plant, or feeding a baby calf! What a great place! Lots of the others feel so impersonal and overdone- not good places for kids to really learn, and way too crowded and muddy. This place has huge beautiful trees backed by cornfields, a pond, and a barn full of animals. SO beautiful! You’d never know it was right there. Don’t waste time driving all the way out to Clayton, Bunn, or Youngsville! This place is the best! Thumbs up to Ganyard Hill Farm! Thanks to this website we decided to take our kids to Ganyard Farms. We all had a blast! Not only did we pick our pumpkins from the vine, we picked corn and cotton too. The kids wore themselves out climbing on hay mountain and jumping in the corn crib. It’s nice to take your kids to a place where they can learn and play! Thanks Triangle Explorer for the recommendation.